I want to start my favourite receipe as the first post for this new year 2009. The main ingredients are as follow..
First, take a small pan and pour a drop of oil and fry coriander seeds, channa dal, urid dal, black pepper, cumin seeds and asafoetida, to golden brown. Let it cool and grind it into a fine powder. This is the Milagu kozhambu powder. 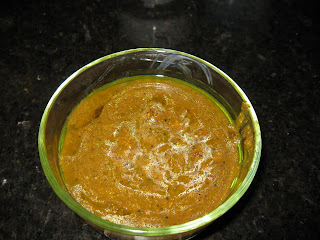 Now take a wide pan and pour the remaining oil and season the mustard seeds, urid dal, methi seeds, asafoetida powder and curry leaves to golden brown (do not burn the ingredients). Now mix the tamarind paste with 2 cups of water and pour it in the pan and add turmeric powder and salt. Let it boil for 4 mts. Now add the milagu kozhambu powder to the tamarind mix and again let it cook for another 7 mts in medium flame. Now add jaggery to it and let it boil for another 3 mts until the oil starts to leave the side of the pan. Here also the consistency should be semi-solid. Now milagu kozhambu is ready to serve and we can keep this kozhambu for atleast a week under refridgeration. without onion you are managing your total samayal? How is it possible Vidhya??? Hi Crissy thanks so much for the wishes and wish you and your family a very happy and prosperous new year 2009. Hi Punitha, I usually don't use onion in milagu kozhambu. This is something I learned from my mother in law. Wish you a happy new year..
A very healthy receipe..My mom also prepare this in the same way..Looking yummy..